Urban fantasy as a genre is near and dear to my heart. And Getting Wilde has so much potential. Sara's an interesting character. An independent woman who acquires magical items for a price, and then gives a good portion of that money back to protecting children who have access to magic, Sara's a bit of a badass in her own right. Unfortunately, she subscribes to a 'ask fewer questions' policy. It shifts her from that 'good' ground to a morally grey zone because she doesn't care what the stuff she acquires is being used for (though she does have some kind of client screening process to keep from doing business with the truly heinous). I actually didn't mind this about her, so much as her head-in-the-sand stance seemed dangerous at various points. I also found that Sara floats through this book from task to task, not often motivated by her own agency but instead jumping into opportunities (or directions or cars) provided by others. That irked me a little--I wanted to see her really steering herself. Instead, she gets backed into corners and often has to take the only viable option available. The plot is all over the place. There's a bigger plot around The Council and what they're up to, as well as Sara's personal quest to help a pair of missing children. The book resolves the latter, but has so many open issues about the former that I felt like we were pausing in the middle of a book rather than finishing the first book in the series. Also, there's a few different mysterious men in Sara's life, and I didn't feel like many questions were answered in this book. Presumably because it's the first in the series, and we're being enticed back for a second view? I wanted more questions answered, darnit! On the magic front, the use of tarot usually falls flat for me--it's often amounts to little more than a gimmick. Getting Wilde gets this so very right. Tarot cards are a key part of Sara's identity, and her abilities. She uses them constantly to provide clues and as a magical security blanket to calm her mind while she's on the job. I really liked that dual purpose, that sense that consulting her cards is as much a habit that brings comfort as it is a useful task. I did really like the international flavour of this story. Urban fantasy is often region-locked, sticking us in a single city. This story spans Europe, and settles in Las Vegas. I hope that future books in the series are not afraid to branch out in this way! I liked Getting Wilde but I didn't love it. I think I'd have been happier if book two was already available so I could get some closure on a few of the issues raised in this book. 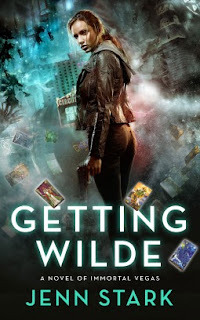 Grab it if you're into urban fantasy that travels, Las Vegas or tarot cards used well (keeping in mind I'm not an expert on them). Still, I'm excited to read a new voice in urban fantasy, and I hope the series gets better!